When one Fort Worth father learned that his son wasn’t planning on voting, he refused to keep quiet. “I was like, ‘Hey, look let’s go vote today…because it’s your right to vote,’ said Martinez Strauther. Martinez said after convincing his son of the importance of voting and the validity of his vote, the two cast their ballots together. Lamartrious Strauther said his vote wasn’t about winning or losing. It was about making the choice to instill change in favor of the one person who influenced him to vote, his father. An enthused voter looks to attract people to the polls. Although much of the attention around the election has been focused on first time and occasional voters, regular voters were a force at the polls. Stacey Samuel loves to vote. She said it takes a community to create change, which is why she encourages everyone to go out and make their voice heard. 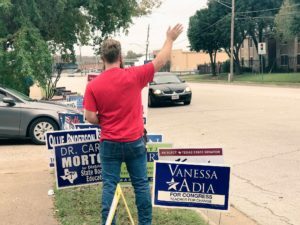 For Fort Worth voter, Joshua Hailey, his ballot wasn’t influenced by previous elections so much as it was by the media. “I mean the country has got to be led by somebody so if we don’t vote, there’s other people who are going to vote,” Hailey said. Grace Amiss is a junior journalism major and managing editor for TCU360. When she is not reporting she is most likely raving about her four-year-old golden retriever or taking a spin class. Grace is currently writing about student life at TCU, so feel free to drop her a line if you come across a story you feel is worth sharing!